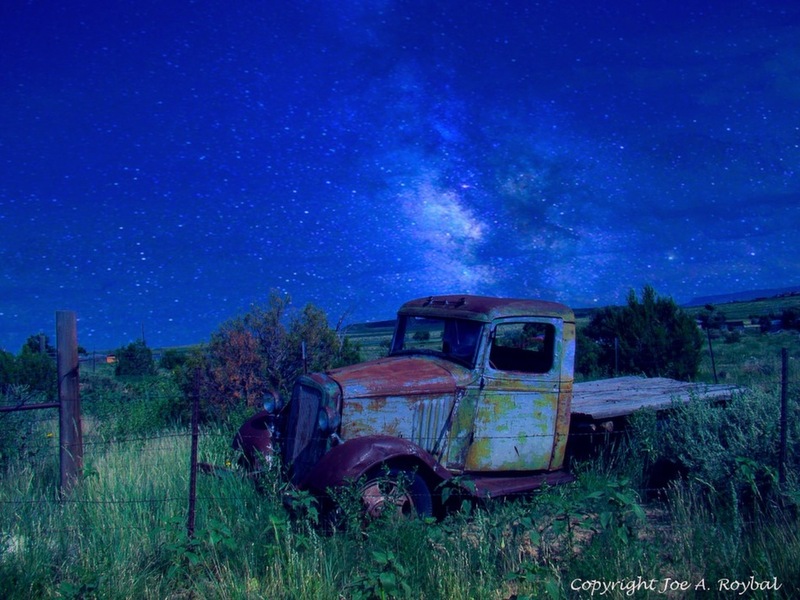 An old truck by the side of the road in Cimarron, NM. Originally taken with a Sony DSC-H50 at 6mm, f5.6 and 1/1000sec. Converted to this image in Samsung Galaxy s8 with an app called MIX and a filter called Magic Sky M212. Milky Way was not part of the original daytime image and moonlight is simulated. I love this, perhaps just a touch less blue but great as is! Joe, it’s amazing you added the Milky Way and simulated moonlight all with the computer in your cell phone. It’s a beautiful image and very well presented. Very clever combination that works really well- a terrific mood -love the added sky. Amazing stuff you can do with a cell phone, huh?